You will need wide elastic and some stretchy fabric for the waistband. I used some knit remnants. You can also use ribbing, interlock, jersey - anything like that. 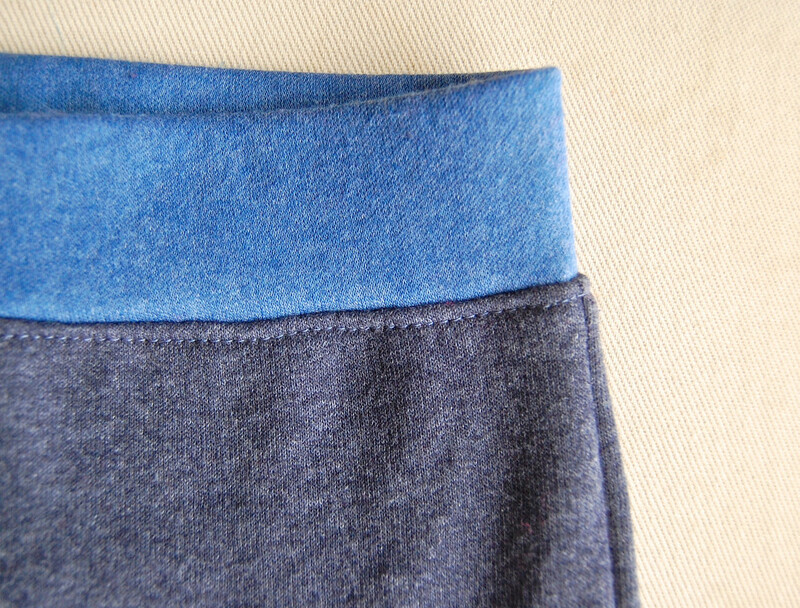 Note that the pants themselves are a little stretchy, being made ​​of sweatshirt fleece. I have not tried this with wovens - it seems incongruent somehow. 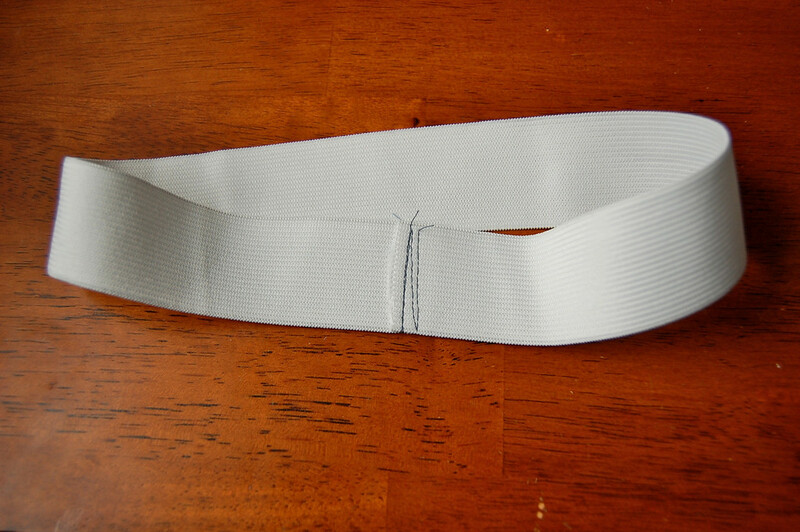 Get wide elastic - mine was 1.5 "wide - and measure and cut the length you need. 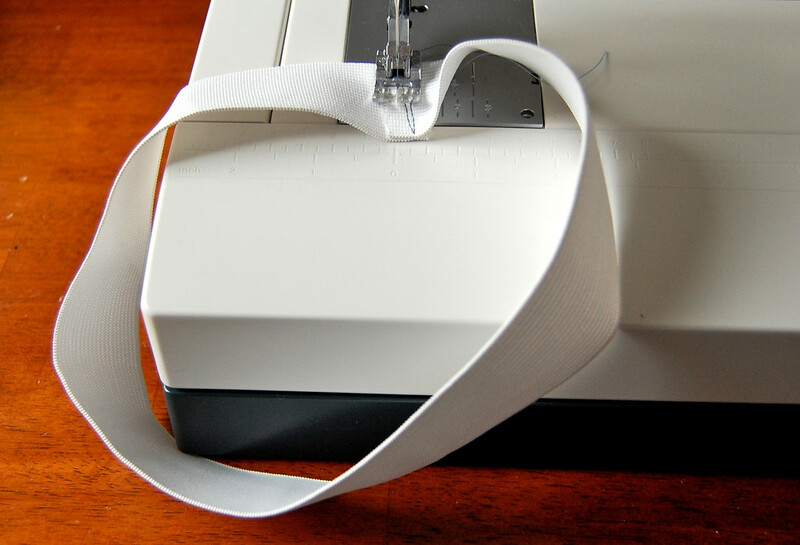 Overlap the ends and sew into a loop. 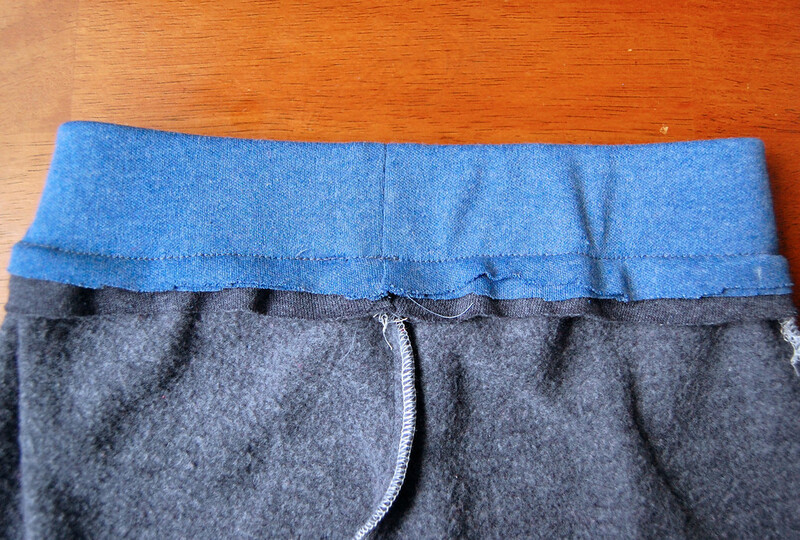 Lay the loop flat on the waistband fabric (folded double along the left edge as shown) and cut to size. This is going to encase the elastic band, so it has to be as long as the waistband, and twice its height plus seam allowance. My waistband loop was 22 "long and 1.5" wide, so the waistband fabric piece, including 1 / 2 "seam allowances, was 23" long and 4 "high. Remember to lay out the fabric so that the waistband stretches sideways (from hip to hip) rather than from top to bottom. 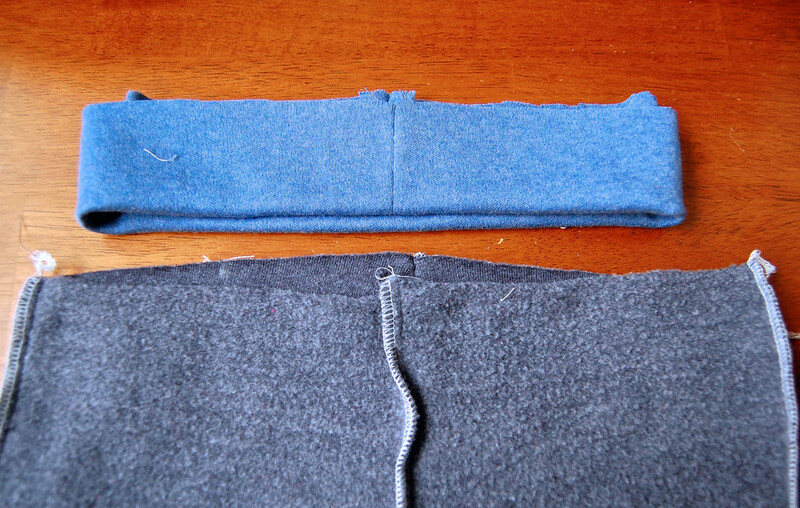 Sew the short ends of the waistband fabric (right sides together) together to make a tube. 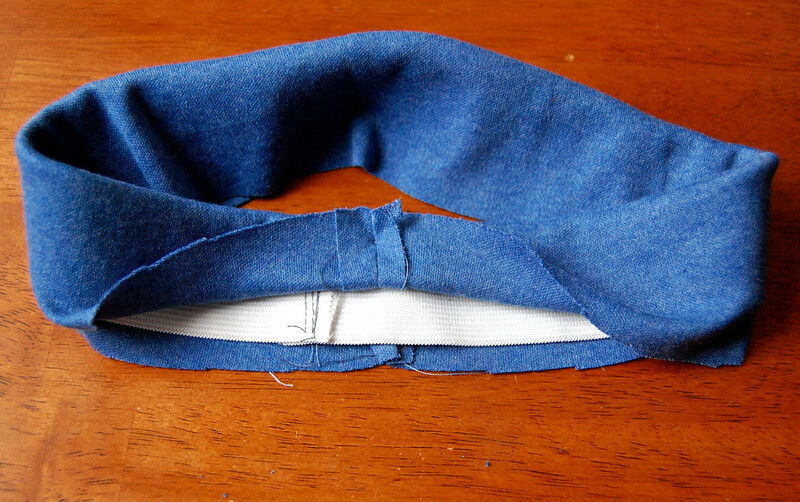 Fold the tube in half lengthwise, with the right sides facing out, and slip the elastic tube inside. You now have a casing for the elastic that hides it completely, and has the bottom edge open. 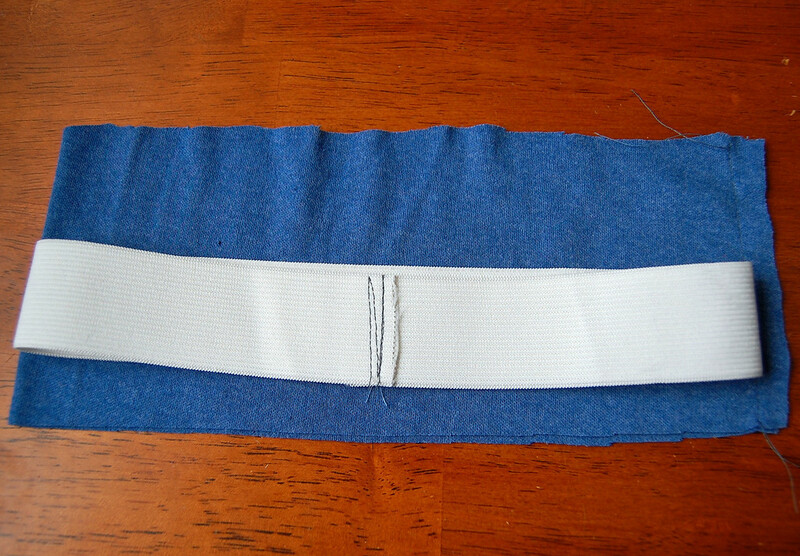 Flip the waistband upside down so the unfinished edge is on top. Notice it is a little smaller than the waistline of the pants. You might want to make quarter-circumference marks along the waistband for alignment with the pants later. 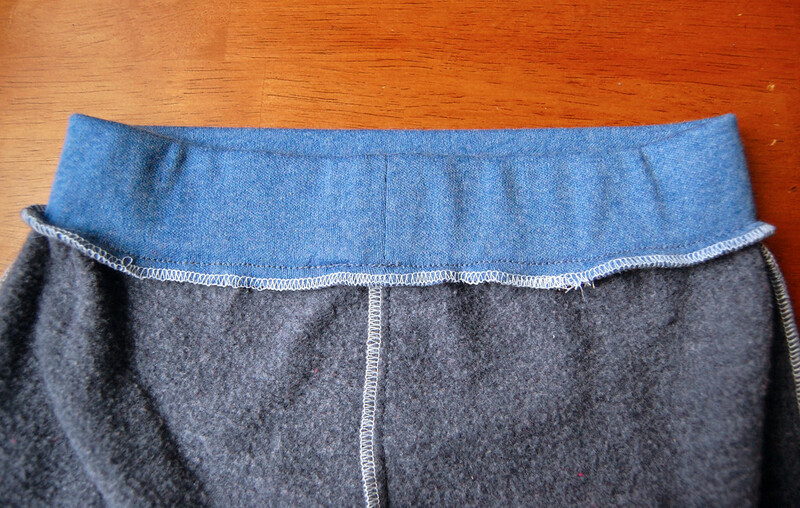 Slip the upside-down waistband into the top of the pants. 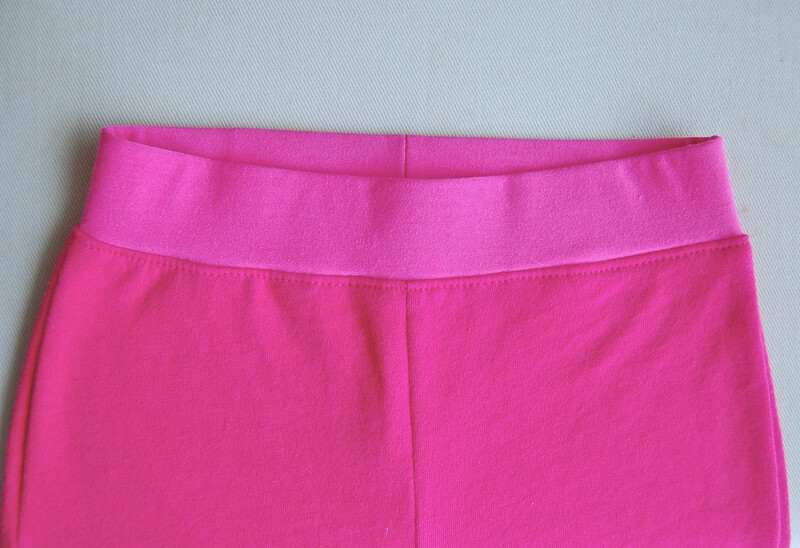 Line up the seamline of the waistband with the back center seam of the pants and pin in place. 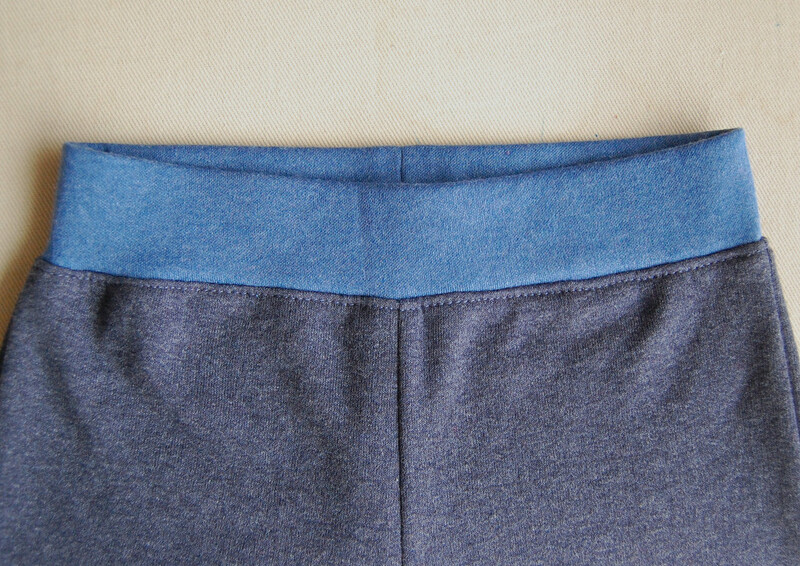 Line up the quarter marks of the waistband with the other seams of the pants and pin those spots in place too. Ignore how my seam allowances are all of different widths - it's just the way I sew. 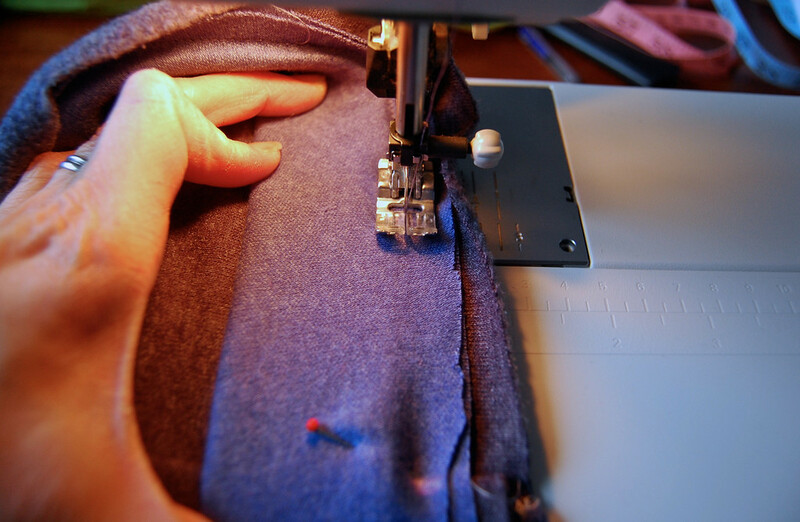 Start sewing, stretching the waistband to match the waistline of the pants as you go. Stretch in both directions - behind and in front of the presser foot. Sew as close to the edge of the elastic as you can, but not on it. Here's a picture to show the bulge of the elastic to the left of the stitching line - the stitching line hugs it pretty closely. 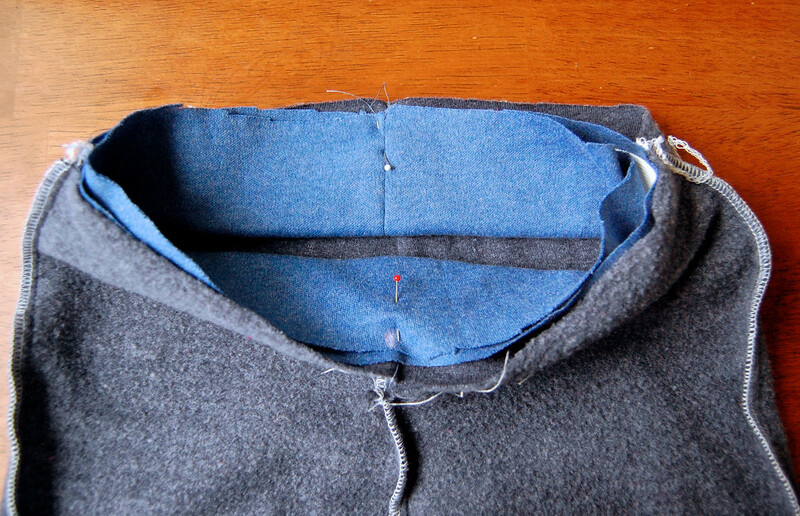 Serge / finish the seam allowance of that seam you just sewed and keep it folded down (not turned up) as in the picture. 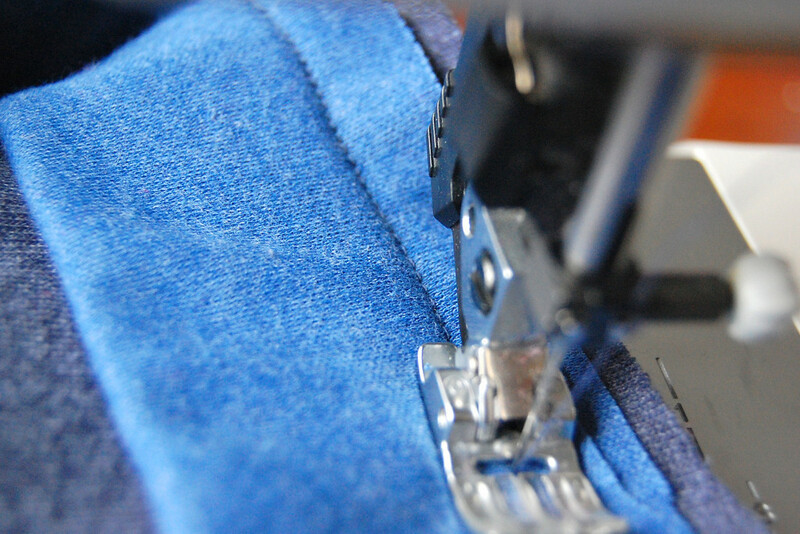 On the right side, top-stitch on the pants, close to the seam, making sure the seam allowance is still tucked underneath so that you are sewing through it to keep it folded down. just to show you that it works even in pink!